I’m extremely honoured to have been invited to write this short post about my daughter Rosie starting mainstream nursery. 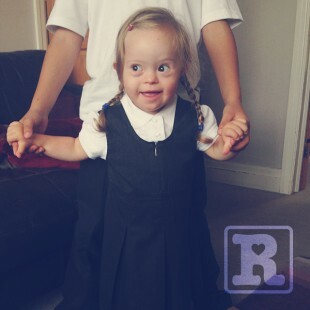 Rosie is four years old and has Down’s syndrome. Every advancement she makes (no matter how small) is celebrated with the same intensity as we did for the milestones our sons reached like first steps, first words etc. So to see Rosie start mainstream nursery was a huge moment for our family and one that (in the early days) I wasn’t sure I’d ever see. We were filled with immense pride seeing her enter the classroom for the first time (albeit carried in as she had yet to start walking). My wife usually takes a back seat when it comes to blogging about Rosie however on this occasion I’m handing it over to Karen as I feel she’s better qualified to write about Rosie at nursery seeing as she’s much more clued up there than I am! We have recently seen Rosie begin her second year at our local mainstream school nursery. Looking back to when Rosie started 12 months ago it is obvious to see the great progress she has made in the past year. She began in September 2014 by doing three mornings a week and for those initial few weeks I was often spending the majority of the morning settling Rosie in to the new routine. She was clingy and tearful if I tried to leave (like many children starting school!). It didn’t take too long for Rosie to get used to her new surroundings and we were then able to increase her hours to five mornings a week by Christmas. At this time, Rosie’s communication was still very limited. Amongst her happy babbling and chattering, she had a small vocabulary of words and signs which she used regularly but a lot of guess work was often needed to try and understand what she was saying. Rosie also had very little motivation to walk and couldn’t take any steps independently. She still used ‘bum shuffling’ as her preferred mode of transport! However Rosie very much enjoyed the new nursery environment especially being amongst her peers of the same age. This was 12 months ago now and looking back it really is amazing to see how she has developed. It’s an emotional time for any parent when a child starts school but personally we found our anxieties were heightened down to the simple fact our daughter has a learning disability. Fast forwarding to the present day and it’s abundantly clear for all to see how Rosie’s first year in a mainstream school nursery has enhanced her development and therefore improved her life too. All of this is down to the amazing network of support and input that Rosie receives. Firstly, the teaching staff in School and especially Rosie’s one-to-one support, Lorraine. Also, Rosie has regular outreach support from our local SEN school worker, Lucy, who is able to advise Lorraine on specific focus areas to work on with Rosie. In addition to this, she is supported by SALT and Physiotherapy, to make sure her needs are being met in these areas. From the very moment Rosie started nursery, her additional needs have always been acknowledged, accepted and embraced. After much consideration and discussions with professionals we decided to defer Rosie’s School entry until 2016 meaning that she is now embarking on her second year in Nursery. As with all children, those with Down’s syndrome have very differing needs – some will develop certain skills quicker than others and we felt Rosie would benefit from the extra year in Nursery. Most importantly, her time in mainstream School Nursery has given her a chance at learning (something she wouldn’t have been given years ago), and, like her peers she now paints, knows colours, loves role play, drawing, knows her numbers (one to three), sings and can make choices when a selection of activities are presented to her. We feel that giving her the chance to learn amongst her peers also helps with her acceptance and will hopefully show others that Down’s syndrome does not define who she. Karen Tom I am really grateful for this blog about what helps when more help is needed. And as always lovely to see the Rosie smile! Hi Viv, it was an honour to have been asked and thank you for the opportunity to share our positive story. A very important snapshot into the crucial provision our children need to flourish in the early days. Thank you for putting it together so eloquently none place Karen. Great debut blog post! So pleased to hear what a positive experience Rosie and yourselves have had. Thanks so much for sharing.